I’ve been getting many calls and emails from readers asking for signed copies of my new book, Make Money Online: Roadmap of a Dot Com Mogul. While I am happy to sign the book for everybody I also know it’s a real pain for people to mail the book to me to have it signed and then have it mailed back to them. What I have done instead is ordered a bunch of books from my publisher to store at my place. 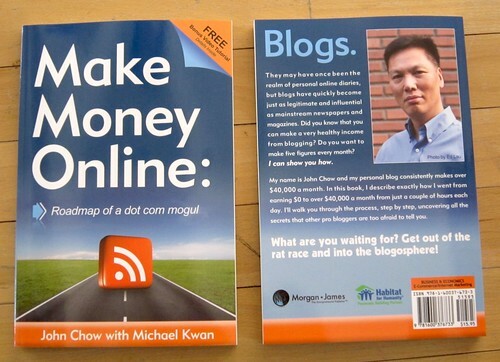 If you would like a signed copy of Make Money Online: Roadmap of a Dot Com Mogul, you can order one direct from me and I’ll ship it out to you. The cost of a signed copy is $20 plus flat $3.99 world wide shipping. Payment can be made with PayPal using this order link. Please include your name and shipping address plus any special dedication you want me to sign onto the book. After you’ve received your book, please take a photo with it and email it to me so I can include it in my photo gallery. The photo will also enter you into a contest to win an Apple iPad. You’ll get an extra entry if you review the book on your blog.